A quick note to say thanks to everyone that donated to Smokey. 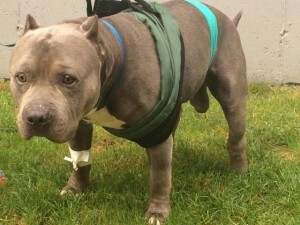 In case you missed it, Smokey is a Pit Bull that was stabbed in Fall River, MA. Smokey was rushed to a veterinary ER and is recovering. The donations have reached almost $2000 and will cover the cost of his care. I really appreciate all the donations for helping Smokey. If anyone has made a donation and has not received my gifts for helping out please let me know.